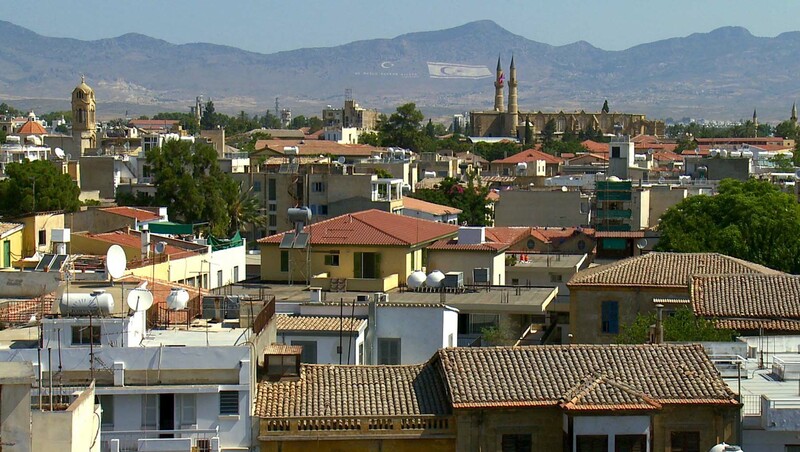 A view across the border in Nicosia, the divided capital of Cyprus. The camera looks over the rooftops of the Greek Cypriot south to the mountains of the Turkish Republic in the north, where a display of nationalism is enhanced by filmic means. Moving between macro and micro perspectives, Flag Mountain sets dramatic spectacle against everyday life as the inhabitants of both sides of the city go about their daily business. 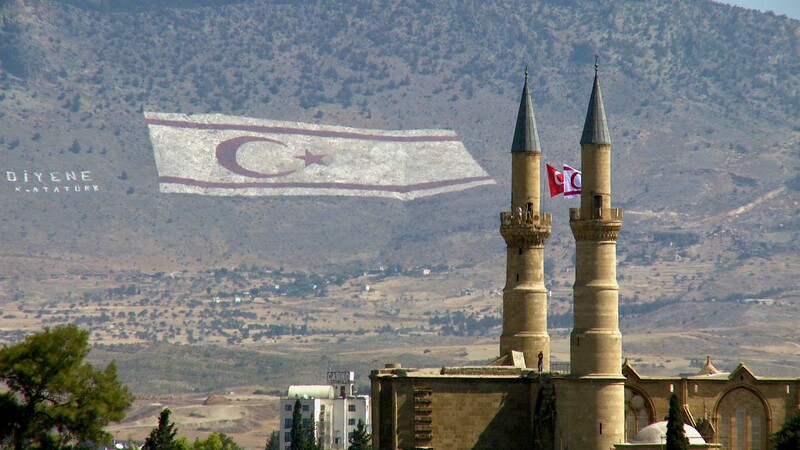 “John Smith’s Flag Mountain records a vast flag, the insignia of the Turkish Republic of Northern Cyprus, painted onto the side of the Kyrenia mountains overlooking Nicosia, the divided capital of the former island nation. The flag, situated in what is officially understood under international law to be ‘Turkish occupied’ northern Cyprus, is accompanied by the legend ‘Ne mutlu Türküm diyene’ (‘How happy is he who can say “I am a Turk”‘). The statement, a quote from the founder of the Turkish Republic, Mustafa Kemal Atatürk, is clearly legible from the south of the city and its surrounding countryside. Deliberately provocative, the flag was produced by refugees from the southern village of Tokhni as a memorial to the 84 male, moslem members of their community aged between 13 and 74, who were murdered by a right-wing militia (allied with the Greek military dictatorship). The massacre was said to have been in retaliation to the Turkish invasion of the north of the island earlier in 1974. Film-making, being time-based, records change. Flag Mountain however can be seen to record stasis. The flag sees the political problems of Cyprus literally writ large and in lights. Deceptively simple, the work documents the flag over a 24 hour period, filmed from a balcony in southern Nicosia. The film opens with the adhan broadcast from a minaret in the north hastening people to prayer and closes to the sound of bells ringing from the towers of Greek Orthodox churches in the south. 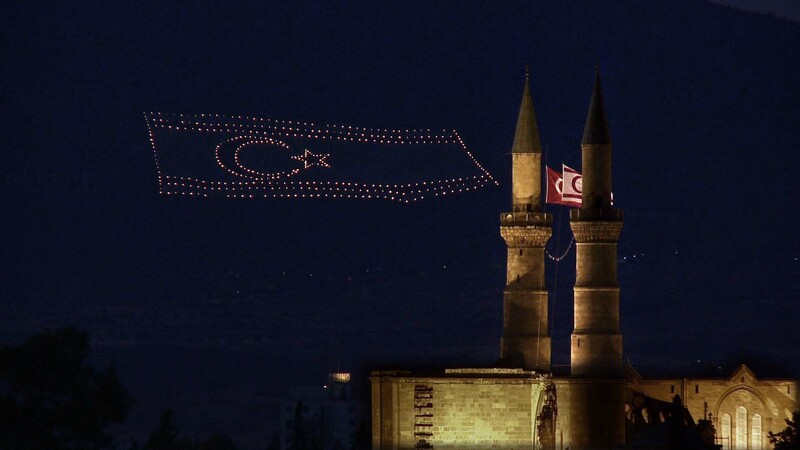 The martial Istiklal Marsi (Independence March), national anthem of Turkey and the unilaterally declared Turkish Republic of Northern Cyprus, accompanies footage of flags of these territories being raised between the minarets of a mosque in the north, adjacent, in the camera frame, to the vast, painted flag (and a casino). The scene then turns to night where the flag is marked out, piece by piece, with synchronised lights like a strange, stellar constellation. The frames flicker between day and night and, when accelerated, take on a stroboscopic quality so that, momentarily, the flag is stripped of its overbearing political charge and becomes a abstract cipher. A device to be deconstructed by editing and analysed formally until dawn breaks and a flock of birds fly in front of the camera, disrupting the exercise.